Never sacrifice on power, portability, and upgradeability. The EON15-X gaming laptop features overclocked 7th generation Intel Core i7 desktop processors on the latest Z270 chipset designed to handle today’s applications and games with ease all in a chassis under 1.5 inches thin. 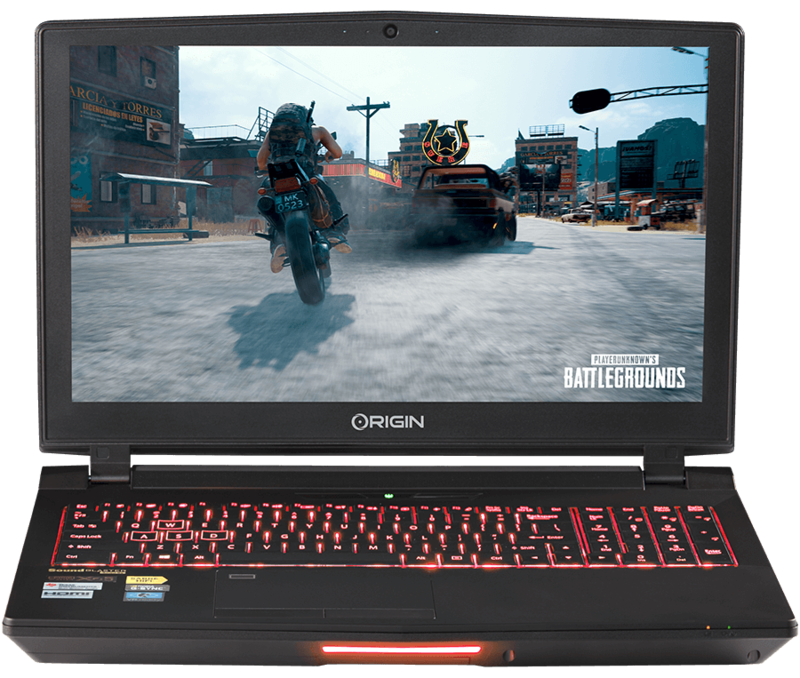 The EON15-X harnesses the latest 10 Series NVIDIA desktop class GPUs with up to 8GB of video memory and is practically future proof with upgradeable graphics cards using MXM technology. Today's latest technology has taken the standard 1080p pixel format and quadrupled it. With twice the pixels, you get four times the clarity for near life-like imaging in gaming, video, and pictures. ORIGIN PC's EON15-X is capable of conquering the 4K future. Gone are the days of getting by with an underpowered laptop. Even for a novice user, current applications, games and programs require a laptop that can multitask to the maximum. The ORIGIN PC EON15-X delivers a custom gaming laptop solution that provides you with all the tools you will ever need to complete any task. Run the latest game titles at breakneck speeds with an overclocked EON15-X gaming laptop powered by Intel's 7th Generation Core i7 desktop processors. Multitasking is a breeze when you can open several programs at once with no slow down thanks to Intel’s Hyper-Threading technology. Increase your productivity and free up more time for the finer things in life. For gaming enthusiasts, configure your EON15-X with an Intel unlocked Core i7 processor for unmatched overclocked performance in today’s most popular game titles. These processors unleash additional power for higher frame rates and smoother in-game performance for the ultimate gaming experience. Experience high-definition graphics and video on your EON15-X gaming laptop powered by the latest 10 Series NVIDIA desktop class graphics cards capable of outputting up to 3 external monitors. Treat your optic nerves to crystal-clear images on a gorgeous 1080p widescreen display or output to a 4K display and immerse yourself in games, hi-definition movies, and photos. Built for the latest DirectX 12, the ORIGIN PC EON15-X line of NVIDIA “Pascal” GeForce GTX desktop class graphics cards deliver unparalleled gaming realism and advanced detailed environments for a whole new level of game immersion. Take mobile gaming to a whole new level with NVIDIA’s SHADOWPLAY™, GAMESTREAM™, and the NVIDIA SHIELD™. Capture, share, and stream your best gaming moments on the go like never before! Games and productivity software alike require more and more system resources. Say goodbye to system lag and hello to maximum processing power when you configure your EON15-X gaming laptop with up to 64GBs of high speed DDR4 2666MHz RAM. Adding additional memory allows system intensive programs and multiple applications to run faster without system slowdown. Never leave any of your crucial data behind. The EON15-X features up to dual lightning fast Solid State Drives and support for dual PCIe or SATA m.2 in RAID drives giving you accelerated access to your data and media. ORIGIN PC’s hard drive options have the capacity to hold all of the music, videos, and pictures you could ever need on the road or access the cloud with a high speed AC wireless network cards cable of over 1.3Gbps transfer speeds. For the first time ever, every GPU in the EON15-X is VR Ready, harnessing the power of NVIDIA’s GeForce GTX 10 Series video cards with full desktop class performance. Whether you're using the Oculus Rift or the HTC Vive, take it to the next level of immersion with your ORIGIN PC. NVIDIA G-SYNC offers an unsurpassed gaming experience with the smoothest graphics ever available in a portable form factor. Whether you’re fighting off zombies in everyone's favorite futuristic shooter or exploring a post-apocalyptic world with your trusty K9 companion, tear-free gaming is now available on the go. Unlike V-SYNC which limits the framerate of your GPU to match your monitor, G-SYNC works by making the refresh rate of your monitor match the GPU. Unleash the full power of your GPU and no longer be limited by a weak monitor refresh rate. Crank those graphic settings to the maximum with the EON15-X powered by NVIDIA’s GeForce GTX 10 series video card(s). With up to 8GB’s of GDDR5 video ram, NVIDIA's PhysX and CUDA technology, top performance isn’t something you seek, it’s a way of life. Take mobile gaming to a whole new level with NVIDIA’s SHADOWPLAY™, GAMESTREAM™, and the NVIDIA SHIELD™, users can now capture, share and stream their best gaming moments on the go like never before! The EON15-X gaming laptop was designed from the ground up for the mobile power user. Our chassis combines the slick design of a sports car with the sturdy construction of an SUV to handle the rigors of your daily tasks. The matte black, matte red, or glossy white ORIGIN PC panel on the top cover of the EON15-X looks phenomenal in any setting. Sometimes even a killer paint job is not enough. Take the reins and send us your own custom logo or artwork and we'll paint it onto your EON15-X gaming laptop. If you'd rather take a back seat, just give the ORIGIN PC artists creative control and we will design a one of a kind laptop just for you. Your data is invaluable, and although firewalls and antivirus software can protect your information from network predators, your PC itself is still vulnerable. With the EON15-X gaming laptop by ORIGIN PC, ease your mind knowing your gaming laptop will be protected no matter where you are in the world. With a built-in area fingerprint reader and Trusted Platform Module (TPM), advanced security is literally at your fingertips allowing only you to log into your gaming laptop with by simply pressing your finger onto the sensor. At ORIGIN PC, our job does not end with the sale, ORIGIN PC stands by you for the life of your gaming laptop. When you purchase an EON15-X, you receive dedicated service from ORIGIN PC’s trained and experienced staff. We offer toll free lifetime phone and online support based in Autralia, and if you are ever in need of repair or upgrade, Team ORIGIN performs the labor for free.